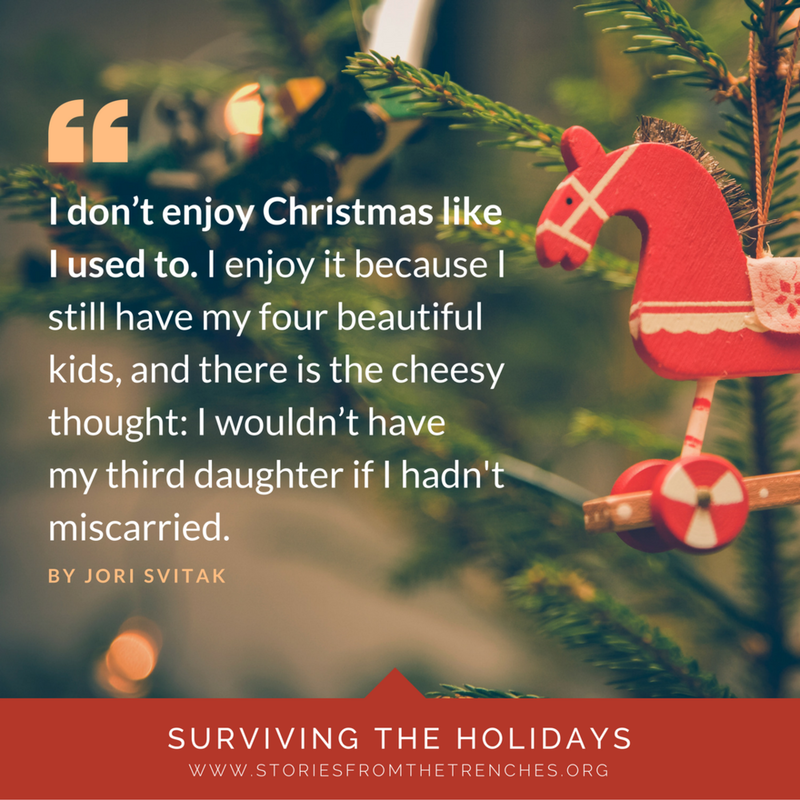 Last year Jen G., founder of Stories from the Trenches, interviewed her childhood friend, Jori. Jori is a married, suburban, stay-at-home mom to four beautiful children. In her spare time, she enjoys knitting, baking, cooking, and reading. Looking at her family, you would never know there is a child missing. In 2003, there was an unexpected yet welcomed pregnancy that brought joy to the whole family. At the time, Jori and her husband had been married for three years, and their oldest daughter was 18 months old. Sadly, her pregnancy ended in a miscarriage, bringing a deep sadness she hadn't foreseen. Miscarriage is rarely discussed, even among women, but many have suffered this same initial joy followed by the sadness of sudden loss. In this interview, Jori shares her memories of love and loss of her second child. Was your next pregnancy planned? No. We were not not trying, or rather, we were not trying to prevent it. How many kids did you want? I knew I didn’t want a “huge” family, but for some reason I always had the number four in the back of my mind. What was it like when you found out you were pregnant again with an 18-month-old at home? I was okay because the baby wasn’t due until July, so my oldest would be two-and-a-half years old by that time. I was neither overly excited nor angry. It wasn’t terrible, but I wasn’t jumping up and down. My first pregnancy was a terrible pregnancy, so I wasn’t sure what was in store for this one. Do you remember the moment you found out you were pregnant? We had just bought a new car the Saturday before, and I wasn’t feeling good. I took a test on October 16, and it showed the two brightest lines I had ever seen. I was probably four weeks pregnant when I took the test. What was your husband’s reaction? He was thrilled. He wanted a big family too. What happened after the pregnancy test? I called the doctor within a week of the test, but she couldn’t see me for another six weeks because I was a new patient. I made the appointment anyway, but it ended up being canceled, as the doctor was paged to be with a woman in labor. No other doctors in town took our insurance, so I had to reschedule. We were coming up on the holidays, so rescheduling was crazy. I never made it to the next appointment—because then, I miscarried. How did you know you were miscarrying? I woke up one morning, right before Christmas, and my bed looked like a murder scene. I wasn’t 100% sure what was happening, since I had placenta previa (which can cause severe bleeding) with my first pregnancy, but I had a gut feeling. I called my doctor's office, but since they hadn’t seen me, they told me to go right to the emergency room. I had to find some place for my oldest daughter to go, and a friend came over to watch her. I did not want to drive myself, so my mother-in-law took me while my best friend found someone to watch her kids and meet me at the hospital. It was the most horrific car ride I’ve ever had. I was bleeding profusely, and my mother-in-law’s lack of compassion wasn’t helpful. I walked into the emergency room and explained: I am 13 weeks pregnant, and I think I am having a miscarriage. They saw me immediately. They did not hesitate to put me in a room. Twenty minutes later, there was a knock on the door—my best friend had finally arrived. She was also five months pregnant, and she felt terrible I was losing my baby while she had hers. The nurse was very nice and asked my mother-in-law to step out of the room, so I had alone time with my best friend. I cried. My best friend cried. At the time, my husband was working as a union truck driver and happened to be in Indiana making a delivery, four or five hours away. Meanwhile, they took me for an ultrasound, and my mother-in-law came with me. She watched the screen for me; I couldn't look at it. She claimed there was a heartbeat, but I knew there wasn’t one. The ultrasound tech was really quiet. I was wheeled back to my room, and the most amazing doctor came in. His wife had just given birth, and he was emotional for me. He told me I had lost the baby at six weeks, but I carried that baby seven more weeks. He called the ob-gyn who was on-call to come and discuss what options I had. By then, my husband was able to call his boss to take the truck and get to the hospital. My parents were hard to find, since it was their anniversary. My husband finally arrived late in the afternoon. I had already met the ob-gyn, but she came back in the room to discuss our options with my husband and me. My options were to continue to let the baby pass naturally or have a surgical procedure known as a D&C. I was already traumatized, and if I let things continue naturally, I probably would've continued bleeding for another week. I couldn't do that, so I chose the D&C. The ob-gyn was waiting for my husband to arrive before conducting the procedure, but it ultimately didn't matter: the operating rooms were taken, and I was pushed back until 10 p.m.
What was waiting all day like? Awful. Absolutely terrible. I did a lot of crying. I don’t think I hit anger at that point. Anger came a couple days later. I was waiting in the prep room for hours, so that when the operating room became available, I could get wheeled in right away. I cried a lot. I couldn’t sleep. I was hungry but not really hungry. I missed my oldest daughter terribly. The worst thing was I couldn’t go home and have them call me when a room was available. I was stuck there, basically lying on a plastic bed, and I couldn’t move or even get up to go to the bathroom. At about 9:30 p.m., the doctor came to tell me they were prepping the room. She explained I would be gassed, and the procedure would at most take 20 minutes. Scary that you can have a child ripped out of you in 20 minutes. Do you feel you made the right choice? Looking back on it, doing the D&C was the best option for me. I could not have gone through the holidays and miscarried naturally. I really don't think I could have. I remember being wheeled down to the operating room and the doctor asking what my oldest was getting for Christmas. She was asking questions not to lighten the mood, but to calm my heart. I counted backwards, and then I woke up in recovery alone, just the nurse and me. Not my husband, my parents, or my mother-in-law. I had to sit in recovery for ninety minutes—alone. I had to be able to feel my legs in order to leave. They gave me a teddy bear, which I still have on top of my dresser. Do you remember coming home? I came home to my oldest daughter and my friend. Before I left for the hospital, my house wasn’t a disaster, but my bed sure was. My friend had cleaned my entire house and made us eight freezer meals. She scrubbed my bed and flipped my mattress. She gave me the greatest gift by buying me new sheets, making my bed and making my room comfortable again. She got me caught up on laundry. She even had fresh flowers on every floor. I didn’t get home until 1 a.m. The next day, we started Christmas festivities. What happened in the days after? More friends came and brought us food. My husband went to the library and brought back ten books to help me focus on something else. I had to do Christmas at my in-laws' home and then Christmas at my parents' home in a haze. I can tell you absolutely nothing about that holiday. I don’t remember engaging in any conversation. I’m pretty sure my husband had to bring me food, so I would eat. So I ate, watched my oldest daughter, opened presents and then asked to go home. And now, 12 years later? I don’t enjoy Christmas like I used to. I enjoy it because I still have my four beautiful kids, and there is the cheesy thought: I wouldn’t have my third daughter if I hadn't miscarried. I get down in the dumps around December 19. I still wonder . . . My heart tells me the baby was a boy. I named him Chris. Recently, his teddy bear went missing—the one I got from the hospital. It was not in the usual place on my dresser. My husband understood my panic and yelled for the four kids to find the bear. My third sweet daughter (who was seven years old at the time) told us, "The bear was lonely." She had taken the bear to introduce him to the other 275 stuffed animals she had on her bed. How do you get mad at that? You just can’t.